Mary Kay products are sold to end users! Mary Kay’s Laura Beitler proudly proclaimed, “The majority of the product ends up with end consumers.” Yet when pressed for details on actual retail sales of products, Beitler admitted that corporate does not track this. Thus, her statement that most product ends up with actual consumers is 100% fabricated. Women join Mary Kay just to make a little extra money! And today Virginia Sole-Smith, the author of the Harper’s cover story, shows what nonsense this is. 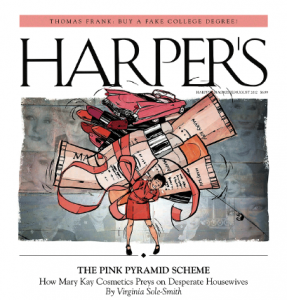 Today she blogs, [Inside the Pink Pyramid] Women Join Direct Sales For All Kinds of Reasons. The post starts with a screenshot from Mary Kay Inc’s. website, clearly touting how LUCRATIVE Mary Kay is. There are a couple of problems with this argument. For starters, it’s a little too convenient for me. 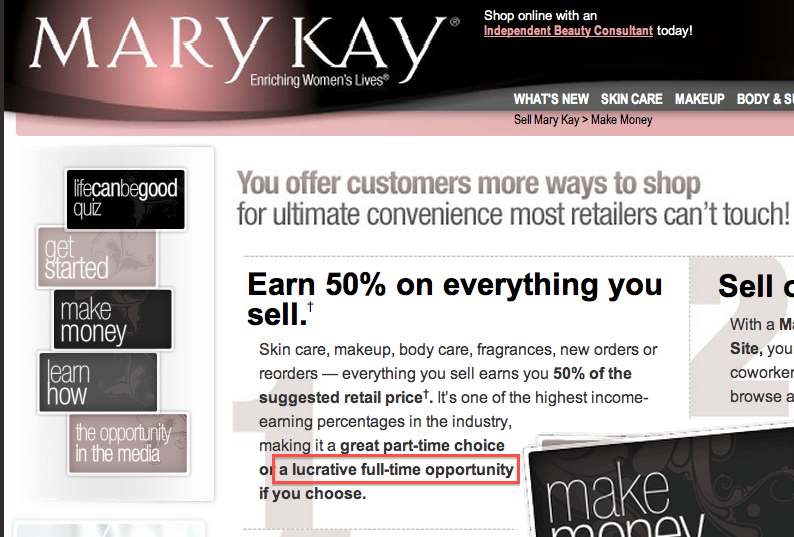 Mary Kay promises a “lucrative full-time opportunity,” (see that claim right there in a screenshot from their website, above, red circle mine). It puts out press releases billing itself as a job creator and the answer to our unemployment woes. In fact, it’s currently pursuing recent college grads, advertising its career potential to twenty-somethings saddled with student loans and facing down a tepid job market. But as soon as we start asking how much money you can really earn in Mary Kay, the tune changes. Now it’s oh don’t worry, most of these women aren’t relying on us for their income anyway. Really? In this terrible job market that you just told us about, with all their debt and unemployment issues? I bought into the lure of easy money hook, line, and sinker. She told my coworker and me her own rags to riches tale, which included how she had kept her family afloat during her husband’s layoff. She talked about financial freedom, economic success, and then showed us her newly earned pink Cadillac. I was sold, and I was going to sell Mary Kay cosmetics to all my Goth and Grunge friends, and I was going to make a killing. In fact, even if you make it clear that this is just going to be a hobby for you, a successful Mary Kay sales director will find ways to increase your inventory purchase. Indeed, all MLMs push the “income opportunity,” but when faced with the the fact that almost everyone loses money, they turn tail and say that no one wants to make money anyway. Why aren’t we teaching young people about finances? Financial education is one key to stopping people from joining these predatory businesses. Most of these people don’t understand cash flow. They don’t understand that if they sink $5,000 into a small business, they will have to sell and recruit like crazy just to break even. They don’t understand that these businesses lie to people about income potential. They’ve never heard the term “market saturation”. These businesses are putting people into debt and ruining their friendships with others. Why? Because states have CUT home economics and similar courses as “unnecessary frills”! Cut drama – where the realities of planning budget for the plays sinks in. Cut auto shop – where the fix-up car is costed out to the penny. Cut band – where the budget for travel is discussed.